When I was a kid growing up in Panama and the Canal Zone, the first thing that was brought to my attention was the dangers of the pesky Cucaracha. That is Cockroach for you gringos. This little critter was in everybodys business. It could ruin your health as well as make your home a very unpleasant place to live. My grandma would often say as I got ready for bed, " Louie dont forget to brush your teeth." It seems that it was common knowledge that roaches would come when you didnt brush your teeth. That sometime during the night if you didnt brush you awoke with a mouth full of cucarachas ... not a pretty sight. This was really a fantastic motivator to get us little kids to brush our teeth before retiring at night. Our tropical quarters in the little town site of Cocoli, like most built of wood were on wooden creosote post about 15 feet off the ground on a concrete slab. The footing of the post had a sheet of tin surrounding the post at the base. It was like a little metal skirt. This was supposed to keep the invasion of bugs from penetrating our lovely abode. Panama being only 8 degrees above the equator and in the heart of the rain forest had all kinds of bugs. In any one day you would see army ants, flying wasp, tiny lizards, yellow-jackets, termites, mosquitoes, killer bees, sand flies, scorpions, centipedes, spiders, slugs, water bugs, bed bugs, you name it we had them. But the most persistent was the CUCARACHA. Back then our first line of defense before the "Roach Motel or Combat" was the handy flit cans. At the first sign of cucarachas we would go into action and pump like mad to produce a fine mist. It was like the wild, Wild West during the Cucaracha Wars. We had a flit can at the ready in almost every room of the house. The flit cans contained DDT or Black Flag. We never gave it a thought to lay down a fog of this stuff as we fought these critters day and night. We took the fight to the roaches. We fought them indoors within our perimeter of living space and Public Works conducted the battle outside. The DDT trucks also fought the ongoing good fight against the deadly mosquitoes. About 6:00 PM daily the war would begin. The trucks would lay down a thick cloud of spray as it travels through our neighborhood. If by chance we missed it when it came by our house we would jump on our bicycles and pedal as fast as we could to catch up to the fog that this DDT Truck was laying down. It was the highlight of the evening. No warning about what kind of danger this type of activity posed to us little kids who chased the truck. It kept the mosquito population down. So, we could later play kick the can for at least an hour after the truck went through our neighborhood. But lets get back to the story. When we got home and smelled of DDT we were told immediately to take those awful stinking clothes off and hit the shower like now! After all that running around, a warm shower made us all sleepy. So, we turned in by 8:30 PM. Then sometime during the night we would be hit by a surprise! While sleeping one of these awful creatures would drop on you. You then came out of the bed like " Rocket man ". Then it was bang...bang with a shoe or slipper as you tried to kill it. Worst scenario was to get tangle in your bedding and bed sheets. You would end up rolling around on the floor. Your sixth senses told you that cucarachas traveled or flew together in a group. So if you got the lead flyer, you searched the walls and ceiling for the other ones. Oh, but those flyers were deadly as they came right at you like a dive-bomber. So, you usually created so much racket that the whole household would awake. My mother would yell from her bedroom, " What is going on in there? What is all that noise? " I usually replied with, "Mom, Im being attacked by cucarachas!" She would then answer, " Louie, kill them and get to sleep for you got grade school in the morning." I would continue bang ... and slamming the floor. Then I would answer, "All right Mom. I Think I got them. But you should see the size of this one. I dont know if, Ill ever get to sleep now." And so it went with the Cucaracha Wars. Thinking back the kitchen was another battle zone. As soon as you hit the wall light switch the floor would seem to creep away to under the stove and fridge. And the female had a habit of attaching her cylinder shape eggs with dynamite proof cement. And you could find them everywhere. When they were full what a gooey mess. Empty they would flake away. But the tracks they would leave across books and papers were disgusting. They were also experts in Chemical Warfare. 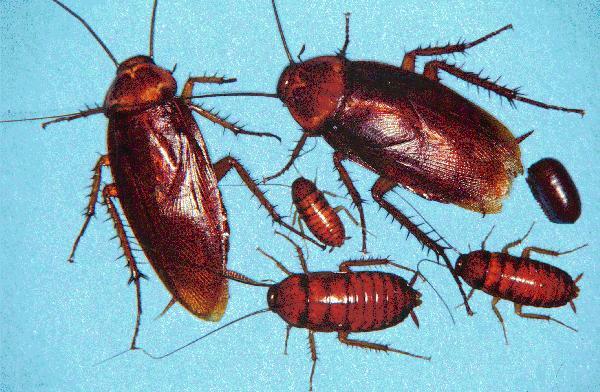 A perfectly looking set of China in a cabinet would smell just awful if roaches had passed. Somewhere I read that they were not carriers of any man killer diseases. Yea, but hey.... what really happen in Boswell, New Mexico? So, one never took any chances with the deadly cucarachas. But you have to remember that they have been around since earths beginning and theyll probably be around after we all evolved into higher degree of thinking species then what now populates Mother Earth. One has to think back and wonder what really drove the dinosaur into the tar pits. It might just have been the pesky cucaracha. Then the Caveman probably left his cave for the open spaces because of these ornery critters. Then the Egyptians had them as visitors to their pyramids and temples. And one revolution: the Mexican Revolution had them as their centerpiece. Yes, the Rebeledes use them as their Fight Song. You know: " La cucaracha, la cucaracha, ya no quiere caminar, porque le falta..." And we as kids always added our own verses as we went along. Something like "Row ... Row your boat gently down the stream merrily, merrily, merrily life is but a dream." Something to keep us going! In a 1996 Hollywood movie Joes Apartment, thousands of singing and dancing cockroaches were featured. Don Ho often referred to as the Hawaiian Dean Martin of the Islands by his fans was also in this movie. Today, the scientific community in California, closely studies the activities of the cucaracha. It appears that the studies so far as shown that when the cucarachas go ballistic an earthquake event is about to happen. Without a shortage of these critters in California or around the world, the studies have intensified. On my visit on home leave to the states to visit my cousins and friends, the addict of the cucaracha was often the center of our conversations. Yes, my cousins thought that I lived in a tree house and the roaches were so big that hey would carry away our young. It must have been all those movies about giant ants attacking mankind on the silver screen back in the 50s and 60s. It had to do with underground testing of nuclear explosions. "... Its still the same old story, a fight for love and glory, a case of do or die..." The Cucaracha Wars are still with us as we go into the next millennium. Today, even with all the advancements in modern science the Global conflict goes on, "mano a mano" in every household of America. The Canal Zone may have just been were the battle was fought more intensely. The fights were house to house and block by block with these never say die pesky cucarachas. In tenting a house you knew that the 7th Cavalry had finally arrived like in the John Wayne movies and a last full ditch effort was underway to eradicate all those pesky critters. Does it work? 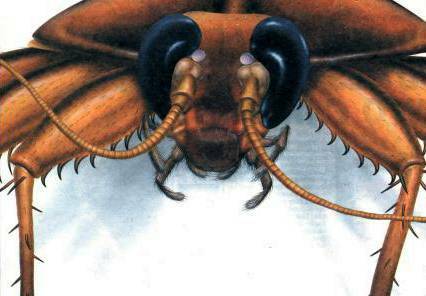 For a while it seems to keep the home clear of all these troublesome pest but very soon you again see the return of the cucarachas. Sometimes the advance guard would be made of Albinos. Scary when you saw their antennae flicking in the air as they froze in the light as deer caught in the car headlights at night on a state road in our northern territories. A Cucaracha out and about looking for trouble. A Female Cucaracha looking for place to deposit her egg. In Panama and the old Canal Zone there were more than 5,000 species of Cucarachas. Fortunately for all of us who lived there only 5 different types like to live indoors in our Tropical Quarters. The worst critters were the giant flying cucarachas. It was an ongoing war with the cucarachas. Flit Cans were always at the ready loaded with Black Flag or DDT.